Make life easy for your dining patrons by giving them easy access to napkins from dispensers right on the tables. Our dispensers are easy to refill and easy to clean. 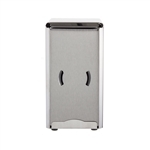 Update International Stainless Steel Napkin Dispensers - 3.88 in. x 4.75 in. x 7.38 in.